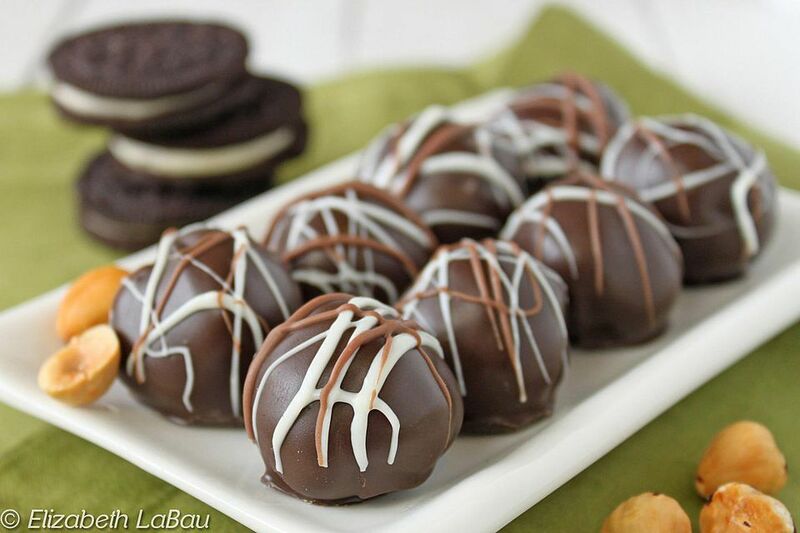 Nutella Oreo Truffles are a twist on traditional Oreo Truffles. Chopped hazelnuts and chocolate-hazelnut spread are added to crushed cookies and cream cheese, to form melt-in-your-mouth truffles with a strong chocolate and hazelnut flavor. Finely chop the toasted hazelnuts and set aside for now. Place the cookies in the bowl of a food processor and process in short intervals until they are fine crumbs. Alternately, place them in a large zip-top plastic bag and roll over them with a rolling pin until they are completely crushed. Combine the crushed cookies, chocolate-hazelnut spread, and softened cream cheese in a large bowl and stir until completely mixed. Add the chopped hazelnuts to the cookie mixture, and stir those in as well. Press a layer of cling wrap on top and refrigerate the truffle mix for half an hour, until firm enough to scoop. Use a teaspoon or small candy scoop to form the mixture into small balls. Roll them between your palms to get them completely round. Melt the chocolate candy coating, and dip each truffle into the melted coating. Place it on a foil-lined baking sheet to set completely. If desired, drizzle melted white or milk chocolate over the tops of the truffles for decoration. Store Nutella Oreo Truffles in an airtight container in the refrigerator for up to two weeks. For best taste and texture, bring them to room temperature before serving. Turn Nutter Butter Cookies Into Delicious Truffles!